Photo by John Schlia Beans and greens using sauteed escarole, hot Italian sausage, cannellini beans, parmesan, and garlic crostini. The name Del Monte has long been synonymous with hospitality in Rochester, so it shouldn't be a surprise that they have opened a restaurant in College Town in the new Hilton Garden Inn. 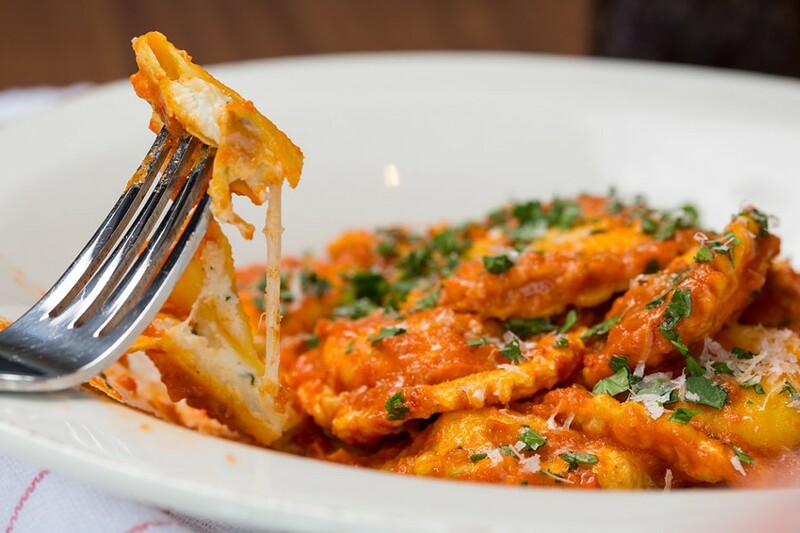 Grappa (30 Celebration Drive) opened on June 30 and features "upscale, casual, modern, Italian cuisine," according to Erica Standish, the restaurant's director of food and beverage. The Del Monte Hotel Group also owns The Erie Grill (inside the Del Monte Hotel and Spa) and Images Restaurant and Lounge (inside the Rochester Airport Marriott). Executive Chef Ryan Wilcox has worked in the restaurant industry in Rochester for 15 years, and has spent 11 working for Del Monte. Most recently, he was the sous chef at Images Restaurant and Lounge. 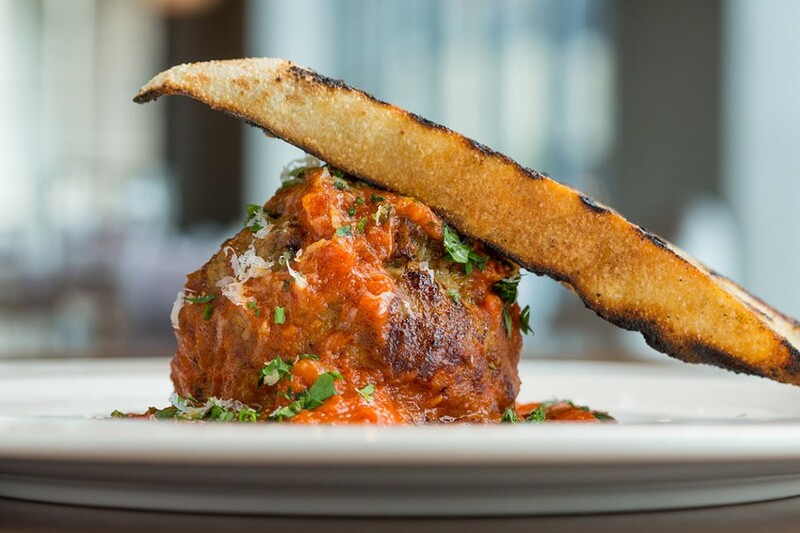 The cuisine at Grappa is "Italian nouveau" with the goal of having something for everyone. Starters include a spicy, sautéed calamari ($12) with roasted red peppers, pepperoncini, arugula, and frisée. Traditional items like greens and beans ($8) and spicy meatball and spaghetti ($16) are also featured. 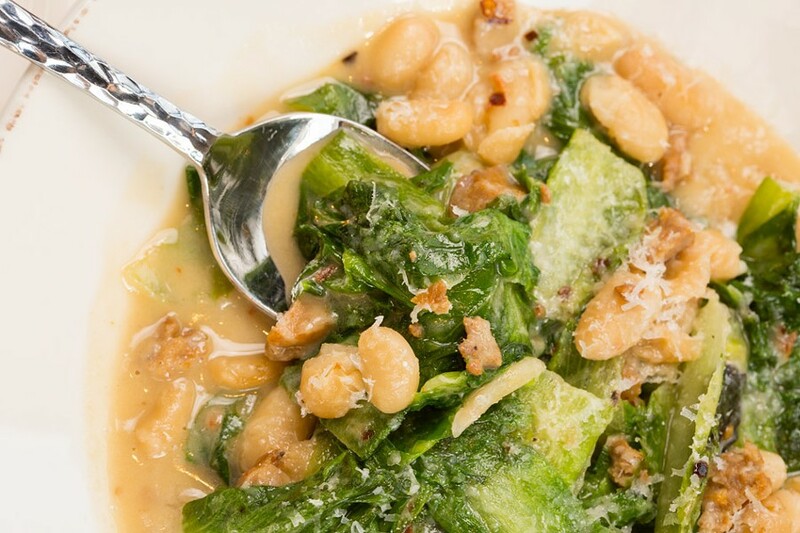 The greens and beans are comprised of sautéed escarole, hot Italian sausage, cannellini beans, fresh herbs, parmesan, and garlic crostini. A variety of pizzas are on the menu, including the funghi ($12) made with garlic béchamel, roasted Portobello, and button mushrooms, and drizzled with truffle oil. Grappa has a large patio that includes fire pits and a lounge area. Its cocktail menu is comprised of grappa and Italian aperitif — in addition to craft cocktails, both classic and new. The Celebration Salute ($11) mixes Tanqueray Rangpur, orgeat bitters, fresh lime juice, and pink grapefruit. Happy hour is from 4 p.m. to 6 p.m. every day and offers two for one bottled beer and wine by the glass. A private dining room is available for special events and can seat up to 18 people. Grappa is located at 30 Celebration Drive in the Hilton Garden Inn at College Town. It is open for lunch and dinner on Monday through Sunday, 11 a.m. to midnight; until 2 a.m. on Friday and Saturday. 445-5770. Visit grapparoc.com for more information. Rochester Brainery (274 North Goodman Street, inside Village Gate) will offer a selection of cooking classes in August. Learn how to make your own sushi ($30) on August 4 from 7 p.m. to 8:15 p.m. A summer sorbet and popsicle-making class ($30) will take place on August 10 from 7 p.m. to 9 p.m. Classes in Indian cooking and French macaroon making also take place later in the month. To register and find out more visit rochesterbrainery.myshopify.com. Honeoye Falls Distillery has opened at 168 West Main Street in, you guessed it, Honeoye Falls. The distillery's current offerings include a Devil's Bathtub "dry rye" Gin, Lantern Light "rye" Moonshine and Frozen Falls Vodka. The tasting room is open Wednesday through Sunday and features craft cocktails. Visit honeoyefallsdistillery.com for more information. The Tap and Mallet (381 Gregory Street) will host an Imperial Beer Brunch on Saturday, August 15, at 11 a.m. Breakfast flights of a variety of stouts will be provided in addition to breakfast sandwiches provided by McCann's Local Meats. The cost of the brunch is $20 per person and tickets can be purchased at the Tap and Mallet. The Rochester Young Professionals Perks Program will sponsor a city-wide restaurant week taking place August 21 through 30. The week-long event aims to promote local restaurants and cuisine. Diners will be able to sample fare from participating restaurants at a reduced rate. More information can be found at ryprrw.wix.com/roc-restaurant-week. Black Button Distilling and the Rochester Rhinos have paired up to present a Rochester Craft Beverage Trail Tasting Event taking place on Saturday, September 12, from 3 p.m. to 6 p.m. at Sahlen's Stadium. Attendees can sample craft spirits, beer, and wine, and watch the Rochester Rhinos play Toronto FC II at 7:05 p.m. Tickets are $35 and include a game ticket, tastings, and a commemorative glass, designated driver tickets are also available for $10. More information can be found at rocbevtrail.com.